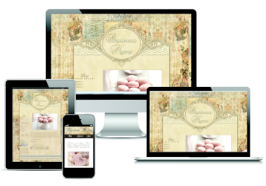 All custom and one of a kind template designs will be upgraded FREE to a responsive and mobile ready template upon installation to your site. If you cannot find a template to your liking in our One-of-A Kind or Limited Edition Templates, perhaps you have your own idea of how you would like your site to look or would like to design a site around your personal artwork. We will be happy to work with your to create a design around your ideas. Custom designs start at $695 and go up depending on the complexity of the design requested and includes up to three design change requests after initial template design based on your requests is presented to you. More design changes will be subject to additional charges which will be quoted to you at that time. Custom navigation images instead of text links for your categories and page listings in your menu are not included in a custom design and you will be charged extra for that service. A custom splash/entry page or animation is also not included with the basic charge. To add a custom splash/entry page please select that additional option below. To add animation please request a quote in the cart options below. Once you purchase your custom site design we will e-mail you for information and if additional fees are required for a more complex design it will be quoted to you at that time and work will begin once payment is received. We do stay busy with custom design requests so please be aware that to get on our schedule for a custom web design you must purchase a custom design first before we will put you on our schedule. If you would like to know how our schedule is looking then please e-mail us and we can give you an estimate of how long it will take before we can get a rough draft of a site design ready for you to view. Wait time is generally 2 to 3 weeks but during especially busy times may be a bit longer so if you are under any time constraints please send us a quick e-mail and we'll do what we can to accommodate you and your schedule. Due to the nature of digital images refunds are not offered but we will do our very best to accommodate your wishes within reason. Custom Designs are put on our schedule after payment is made. Template will be designed according to client's specifications and a sample will be presented to client for feedback. If at any time client fails to respond to emails for a period of over eight weeks client will be deemed to have abandoned project and the project will be closed and taken off of our schedule and no further work will be made on the project and no refunds will be given. If after that period of time client contacts us and wants to resume work on their project then that project will be deemed an entirely new project and the client will be charged accordingly and once paid the client will be added to the bottom of our schedule to wait their turn again.